(This product is discontinued. Please see 9902-UDX for its replacement. Where audio processing options such as loudness processing, upmixing, and/or Dolby encode/decode are also required, please see 9902-UDX-DSP). The 3G/HD/SD-SDI Fusion3G® 9901-UC offers up conversion, frame sync, and advanced audio and ancillary data support, plus many other powerful features. Full audio support includes per-channel audio delay. Remote control is quick and easy with the free DashBoard™ remote control software or the Cobalt OGCP-9000 remote control panels. 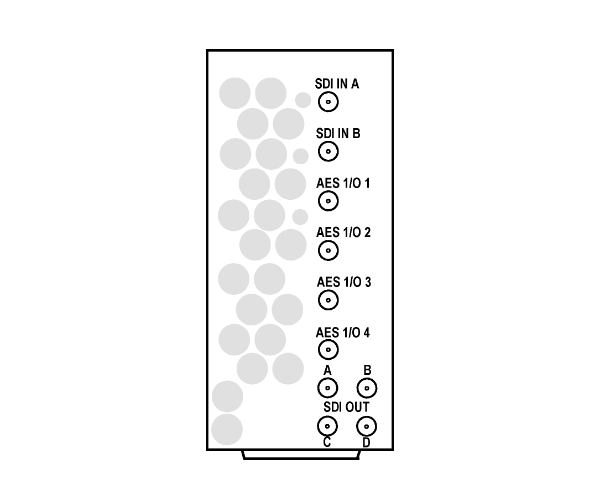 You can select from options to add (as inputs and/or outputs) fiber, analog video, AES, and analog audio. This level of integration reduces module count and simplifies the signal chain, as well as providing flexibility for ever-changing requirements, including 3-D TV compliant 1080p. Options also include wings insertion, general purpose keying, color correction, Dolby® E/AC-3 encoding, ITU/ATSC/EBU compliant loudness metering, and Linear Acoustic® upmixing and loudness processing. The 9901-UC offers up-conversion from multiple formats providing a more economical solution where full conversion capability is not required. If later desired, the 9901-UC can be field upgraded to full 9901-UDX (up/down/cross convert) functionality using a firmware upgrade without removing the card from its frame. 9901-UC-HD HD/SD Only model. Provides up conversions from SD to HD only with SD or HD passthrough. All other features and specifications remain the same. Our Fusion3G® cards support the broadest array of options of any cards in our line. Using these powerful options is like having two or more cards in one card. Adding options allows adding processing versatility without the expense and space usage of extra, added cards. Many Fusion3G® options can be field-installed via an easy software feature upload, allowing select options to be installed as needed on already-installed cards. Software option upgrades typically take less than a minute to upload and require no removal of the card from its frame (these options of course can be ordered for new cards with the option already installed). All of the Fusion3G® options described here can be installed on any Fusion3G® card (unless noted otherwise). 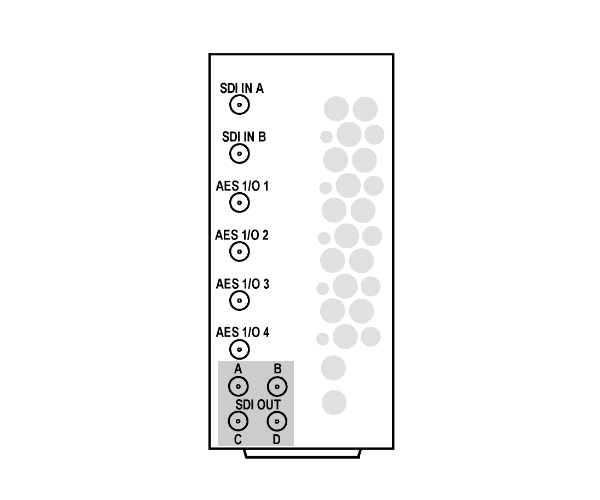 Provides eight (total) AES pair BNC connections that can be GUI-configured as inputs or outputs. 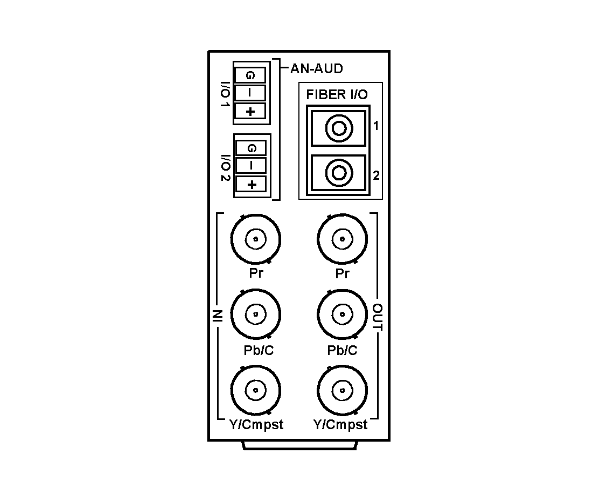 Independent SRC for all AES inputs, with auto and manual bypass for non-PCM data. Installation: Licensable feature ordered on new card or can be field installed with feature upload. 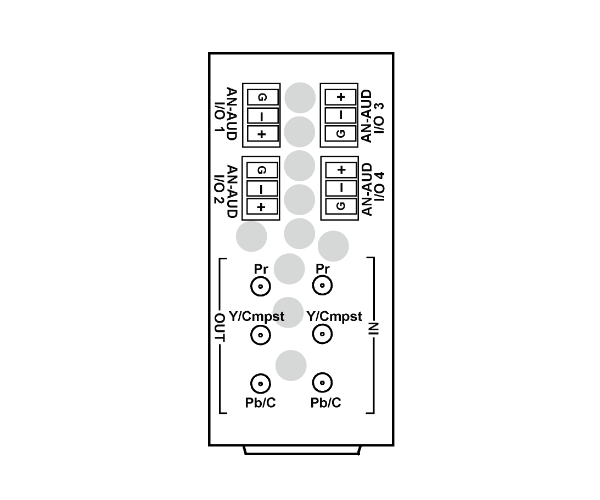 Requires appropriate compatible rear I/O module(s). 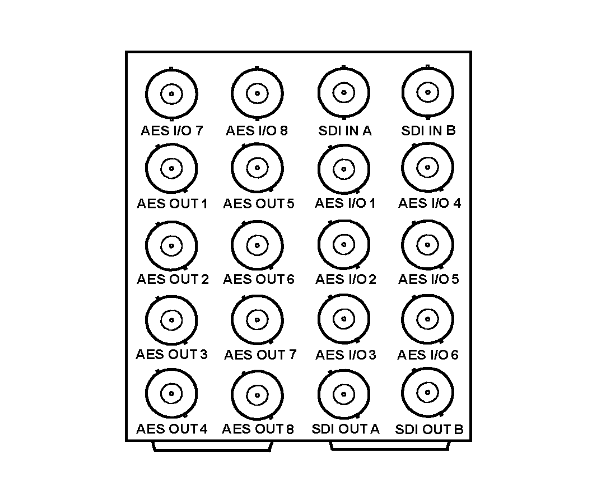 Provides the 16-channel embed/de-embed of option +AES (see above) as well as eight added AES output ports to provide a total complement of AES I/O 1 thru AES I/O 8 and added ports AES OUT 1 thru AES OUT 8. 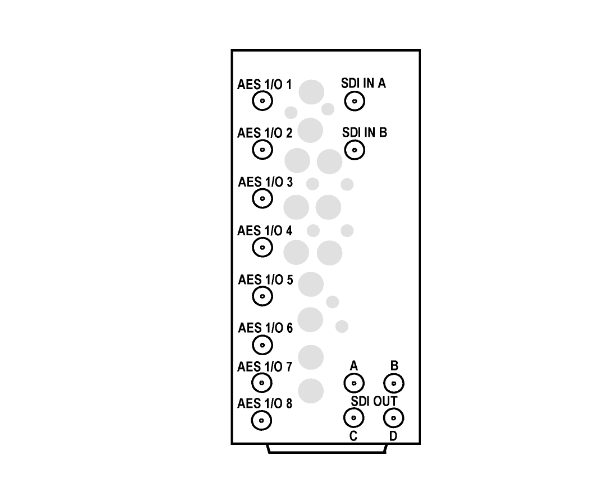 Allows 16 channels of AES embedding and 16 channels of AES de-embedding simultaneously. Assorted options provide balanced analog audio and component/CVBS video input/ouputs. Installation: Hardware feature available only on new card. 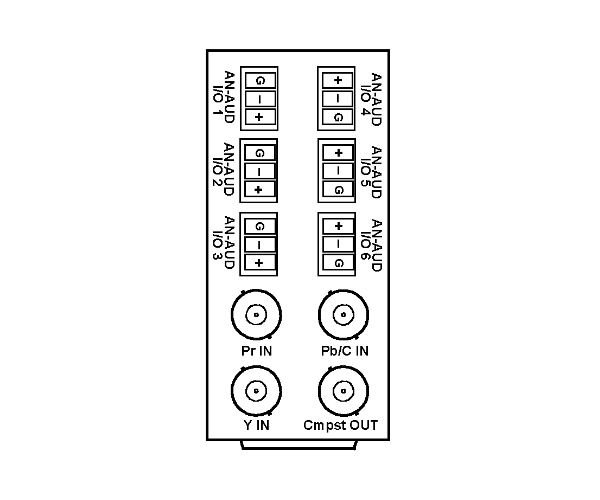 Requires appropriate compatible rear I/O module(s). Provides automatic stereo downmix from selected alternate multi-channel sources if primary stereo channels lose signal. Installation: Licensable feature ordered on new card or can be field-installed with feature upload. Provides automatic failover to alternate ("secondary") channels to substitute for the primary channels in the event of audio signal loss. Provides full assortment of Dolby® Digital/Digital Plus encoding formats with multiple stream encoding – all on the same card. Uses any combination of audio sources supported by the card (including mixed, upmixed, and loudness processed signals). Encode using internal metadata selections with a full complement of encoding formats and bit rates, as well as from serial or SMPTE 2020 external metadata. Contact sales for information about multiple simultaneous encode modes. Provides Dolby® E encoding from any combination of audio sources supported by the card (including mixed and loudness controlled signals). Full metadata support using internally generated or external metadata via SMPTE 2020 or serial. Can be added to card already equipped with ENCD option(s) above. Installation: Licensable feature +ENCDA ordered on new card or can be field-installed with feature upload. Using Linear Acoustic® AEROMAX® algorithms, performs ATSC A/85-compliant 5.1 or stereo loudness processing on any of six channels outputted by the card. Featuring Linear Acoustic® UPMAX™ technology, the 5.1 upmixer uses any stereo pair accommodated by the card and generates a six-channel 5.1 complement (L, R, C, LFE, Ls, Rs) from the stereo source, allowing legacy stereo programming to fully utilize 5.1-channel audio capabilities. Upmixing can be combined with loudness processing options as listed in +LP51/LP20 above. Adds Loudness Metering software which works in conjunction with the award-winning OGCP-9000 Remote Control Panel and our new WinOGCP Desktop Virtual Control Panel to provide a flexible, complete solution for ingest or on-air loudness metering, assessment, and records. Where Fusion3G card is licensed for +LP option(s), +LM option allows selection of pre-processed or post-processed loudness to be displayed. Several cards can reports loudness data to one or virtually any number of control panels. Provides up to two fiber connections per card. 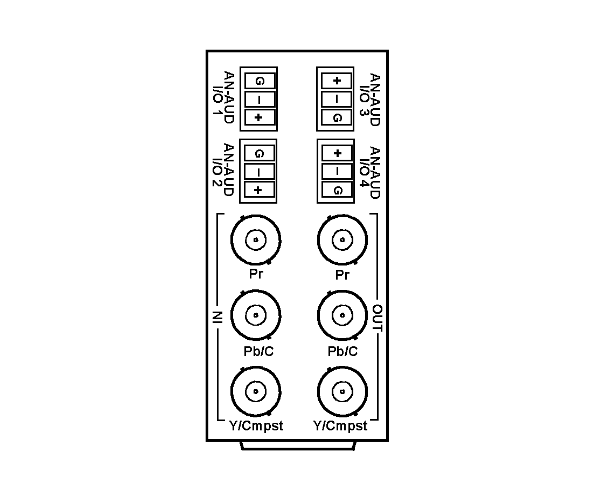 Connector type is dual LC with blind-mate connectors. Cards are fully swappable. Provides independent RGB channel controls for luma, black, and gamma. Ultra-fast response time. The color correction feature is perfectly suited for use with Cobalt OGCP-9000/CC Remote Control Panel. 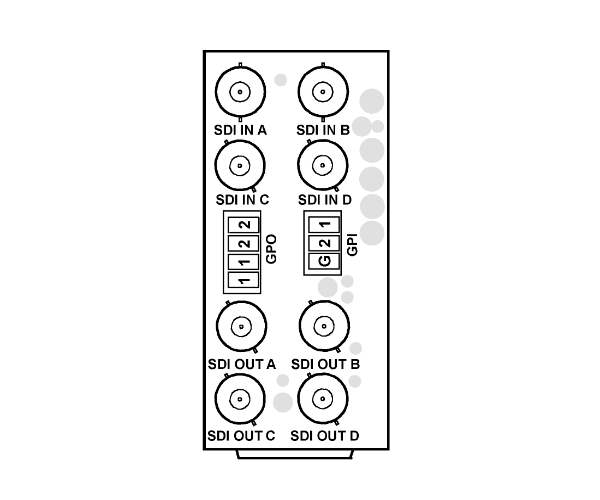 Provides keying using independent SDI inputs for key and fill signals. A separate preview SDI output is provided for observing key results before applying to program video output. Alpha Threshold mode allows full-color key/fill using low-cost PC-based graphics host where the same signal provides a shared key/fill input. 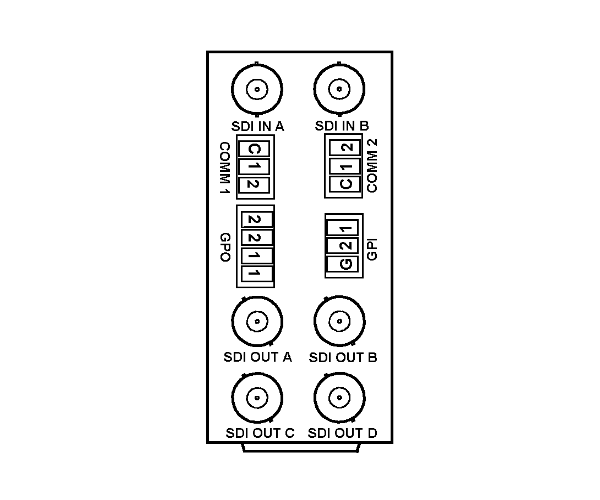 Provides wings insertion using an independent SDI input provided for wings signal. On cards equipped with a scaler, allows wings insertion width to automatically track with AFD. Allows bidirectional transfer and conversion between video timecode formats and audio/RS-485 LTC. Audio LTC can be received or sent over various card audio channels. 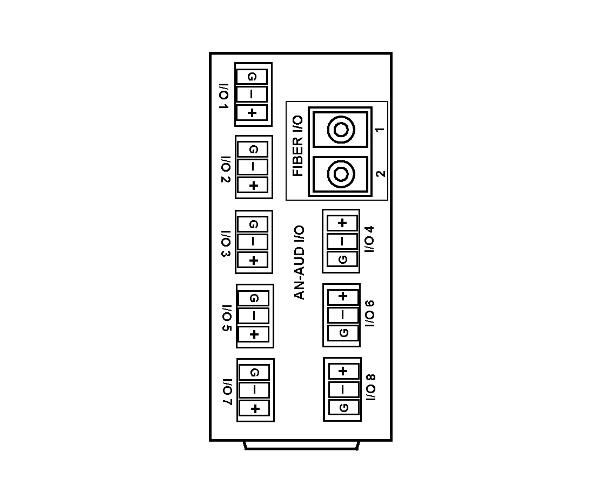 RS-485 LTC can be received or sent via a rear module RS-485 port. On card purchased as alternate HD/SD model (for example "9901-UDX-HD"), allows upgrade to full 3G/HD/SD-SDI I/O and processing. Installation: Licensable feature can be field-installed using software feature upload. Increases frame buffer to provide independently adjustable audio and video delay buffer capacity to over 46 seconds for SD video, 9 seconds for HD video, or 4 seconds for 3G video. Installation: Hardware feature available only on new card. 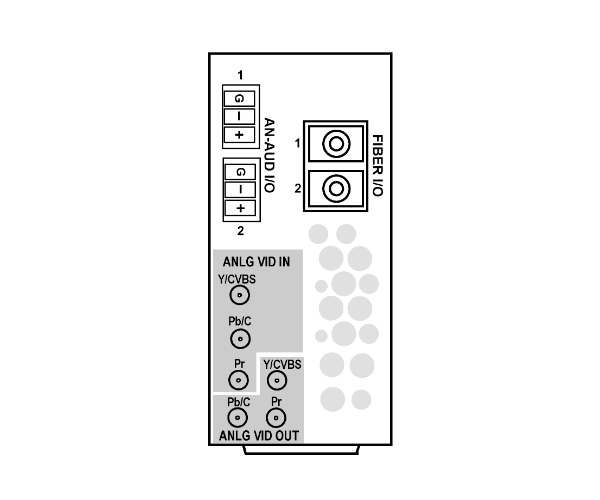 Provides controls for using analog video CGMS copy protect bit/indicator. Complement/Signalling: Two, independent. Non-referenced SPST relay closure upon true condition(s). 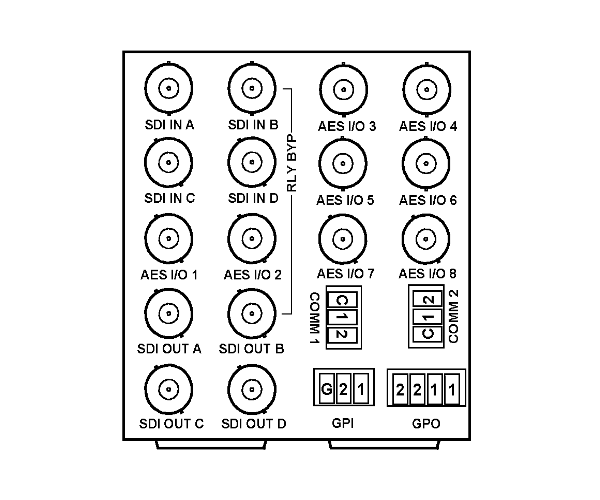 Base Rear I/O Modules provide connections for standard card BNC video and audio connections, as well as other connections depending on rear module part number. These modules mate directly with the Fusion3G® card. 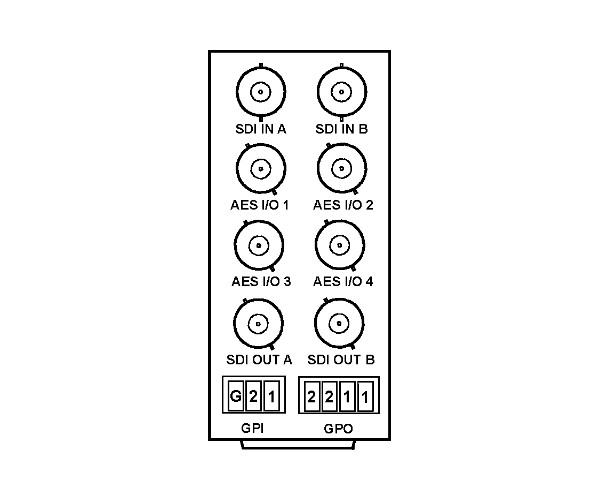 Expansion Rear I/O Modules are required for some video and audio options, such as analog audio/video and fiber connections. These rear modules mate with an Expansion piggyback card that is mounted to the base Fusion3G® card when equipped with these options. 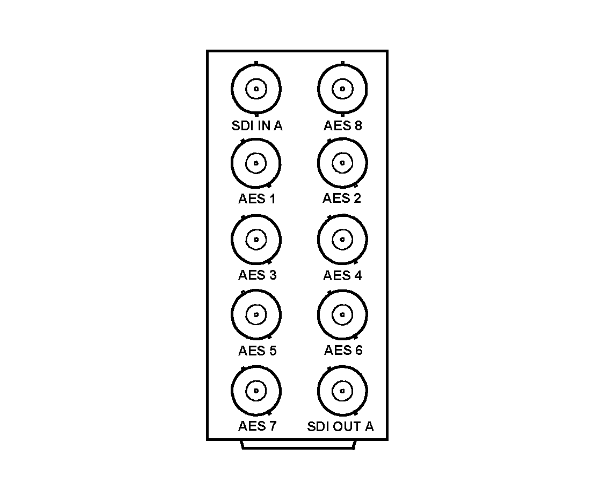 Expansion Rear I/O Modules are identified with ‘X’ in the part number and must be used with a Base Rear I/O Module to provide the full complement of card connections. 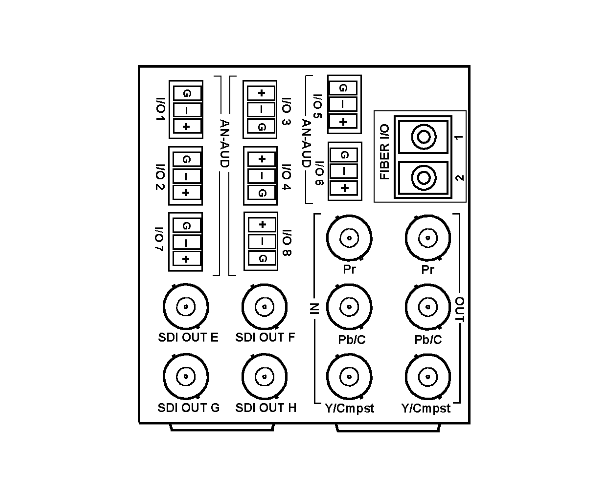 See About Cobalt Rear I/O Modules and Rear Module Cross-Reference at Reference and Help Documents for more information. See Options for a full list of available options, descriptions, and option ordering codes. 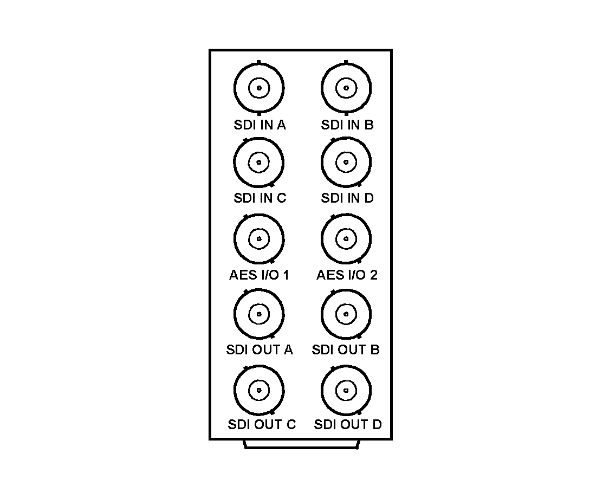 Expansion Rear I/O Modules are required for some video and audio options, such as analog audio/video and fiber connections. These rear modules mate with an Expansion piggyback card that is mounted to the base Fusion3G® card when equipped with these options. 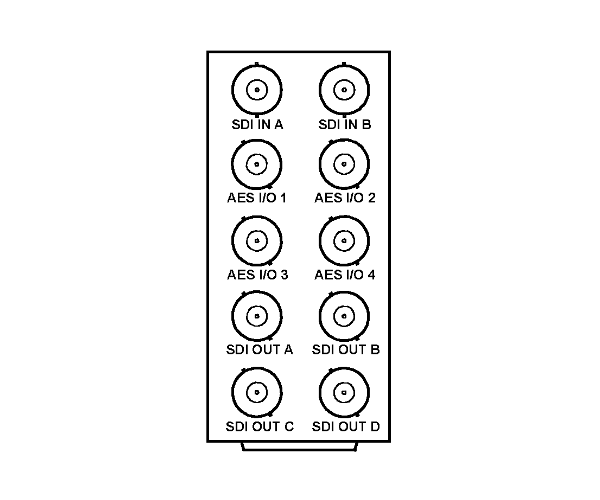 Expansion Rear I/O Modules are identified with ‘X’ in the part number and must be used with a Base Rear I/O Module to provide the full complement of card connections. See 20-Slot Frame Card Capacity and Rear Modules for more information. You are currently requesting a quote for 9901-UC.